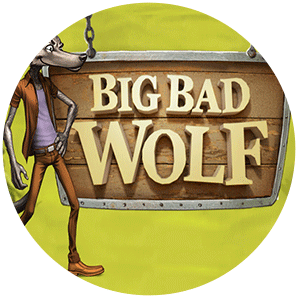 Big Bad Wolf Slot - Experience a top level slot from NetEnt! There are thousands upon thousands of different slot games that you can play online. But the truth is that most slot games; and online casino games in particular, are created by a few top-level companies that specialize in the creation of the casino games of the highest quality. You may have heard about the story of the three little pigs and the big bad wolf. It’s a classic kids’ story that holds important morals. Well, this story has been turned into a slot game, created by the game-designing company NetEnt. You can find some more information on this game below. As mentioned earlier – the storyline of the game is focused on the story of the three little pigs and the big bad wolf. And the entire graphic of the game is designed in a kid-friendly game. Of course, gambling is illegal in most countries when it comes to people below the legal age of 18; but if you find cartoony animations interesting, even though you’re above the legal age, then you will find the graphics of this game interesting as well. You will be able to see various symbols in this game; ranging from the symbols of the cards’ numbers; to the portraits of the three pigs themselves. It’s a fun thing to look at; and it’s designed with style. The symbols have various values assorted to them. You can see the pay table for more information. Also, the game features 25 pay lines; which means that you can combine the symbols of any given spin on 25 lines. There’s the wild symbol that can take the place of any other symbol of the game. And there’s scatter symbol, which can give you 10 free spins – if you can hit three of them on the reels at the same time. Another bonus feature that you get in this game in specific; is the pigs turned wild feature. This means that with a number of consecutive wins; you will see that the regular pig symbols are turning wild one by one; and they can now substitute any other symbol of the game except the scatter. Finally, a neat thing happens when you hit three moon symbols. The blowing down the house feature gets activated; when the wolf blows the house of the pigs down. For this you will get two free spins; and if you manage to hit 6 moons on the reels on a single spin, then you will get 2 free spins plus a 2x multiplier bonus. Even though this may seem like a kids’ game, we assure you that even adults can experience a fair share of fun while playing it. The visuals are cartoony and very fun to look at; and the game itself is proficiently designed. We expected nothing less from the game designing giant NetEnt.